Fair warning, right from the get go there are gong to be a lot of spoilers for book 1. It would be impossible for me to describe what is happening in this book without saying things that were revealed later in the first book. So get out now while you still can. Amani has been captured and is carried across the sea to Izmani, the capital city, to meet the Sultan himself. He binds her using old Djinni logic, and compels her to summon her father, an actual Djinni, which Amani assumes is for the purpose of quelling Ahmed’s rebellion. With her indifferent father stuck in the basements of the palace, and herself stuck in the dangerous, political confines of the harem, Amani must figure out a way to get information from the palace and out to the rebellion to try to help and to beg for help escaping. Usually I don’t enjoy the middle child of a trilogy. It’s the messy middle of a sandwich where stuff from the first book is wrapped up and stuff from the third book is foreshadowed. 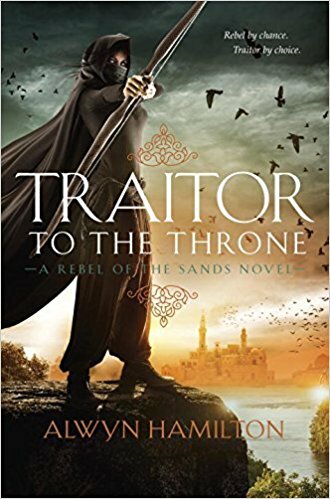 While these things are true about Traitor, I was pleasantly surprised to find an actual story all its own nestled in the heart of this second book. The Sultan has embedded iron within Amani’s skin to prevent her from using her powers, and he has embedded other metals inscribed with the name of her Djinni father as well to bend her to his will. If he makes a command, she must follow it. Yet, even with this control over her, he shows compassion and honors her skills in the midst of his treaty negotiations with the visiting countries. It was interesting to see the villain that was painted in the first book be softened into slightly lighter colors. I mean, he’s still doing terrible things, but you get to see why those actions are being taken. I have to admit that, given what I know about government and what I’ve read in other books, I really appreciated Hamilton giving life and humanity to the man we are supposed to be hating and rebelling against. It’s relatively easy to scream hope and change, A New Dawn/New Desert! but it’s entirely another to broker peace agreements with countries that want to annex you and take you for their own. With great power comes great responsibility, and while different people handle that power differently, most find that some kind of distasteful decision must be made for the good of all, as opposed to the choice that might have been made based on an individual’s beliefs or morals. The complexity of this second book was what kept me reading. My alliances changed a few times as I read, and I am excited to see how the trilogy concludes in the most recent and final book – Hero at the Fall. Go get you some.